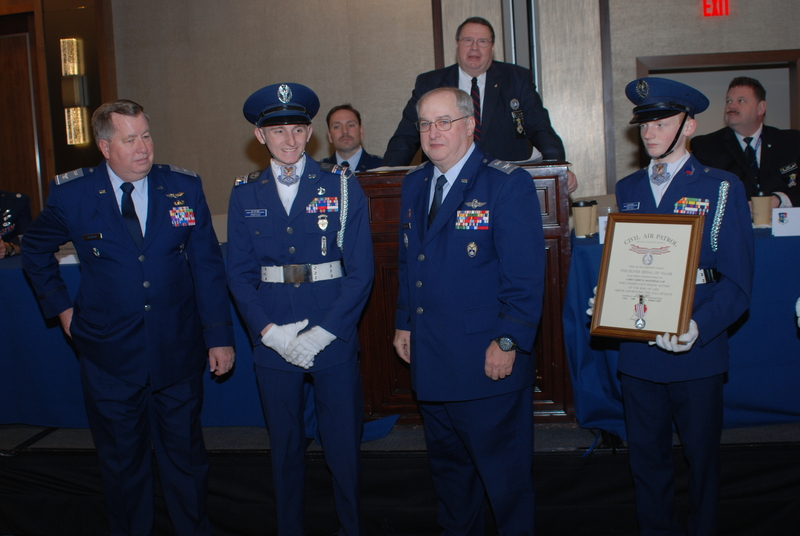 C/Lt Col Aiden S. Maxfield received Civil Air Patrol’s Silver Medal of Valor at the 2017 NC Wing conference in Durham, NC. The Silver Medal was presented by Col Larry J. Ragland, the National Executive Officer for CAP and former NC Wing Commander. The Medal was presented in recognition of Cadet Maxfield’s bravery in assisting his grandfather with a medical emergency at great danger to his own safety. The Silver Medal of Valor is the highest decoration that may be awarded to a member of the Civil Air Patrol, the official civilian auxiliary of the United States Air Force. According to CAP Regulation 39-3, the Silver Medal of Valor is awarded to an active Civil Air Patrol member for "distinguished and conspicuous heroic action, at the risk of life, above and beyond the call of normal duty." Cadet Maxfield is with MER-NC-022, the Burlington Composite Squadron. C/Capt Aiden Maxfield, CAP, distinguished himself by conspicuous heroic action at the risk of life, above and beyond the call of duty, on Mt. Hood, OR on 4 June 2015 when he took charge of the rescue effort despite risks to his own safety. As they neared the summit and passed 11,000 feet elevation, Ward Maxfield collapsed and proceeded to slide 400 feet down the ice field and off an ice shelf. As soon as Cadet Maxfield saw his grandfather slide past him, he turned and began to run down the ice field. He quickly realized that it was too dangerous to run and sat down to perform a controlled slide down the ice. He had to move his ice ax from side to side to maintain control and reach his grandfather as quickly as possible. As he reached Ward it was obvious that there was a significant possibility of a spinal injury. Immediately Cadet Maxfield's Civil Air Patrol training took over and he took charge of the rescue effort. He quickly assessed the scene and identified what needed to be done and who was available to offer assistance. Cadet Maxfield checked Ward's vitals revealed that he was not breathing and had no pulse. He then directed others to assist in repositioning his grandfather so that CPR could be initiated. Because of where Ward had fallen, they were required to lift him onto a small ice shelf to have room to provide CPR. Cadet Maxfield directed the others in proper stabilization and positioning for the move and to begin CPR. Cadet Maxfield initiated the CPR. Due to the severity of the fall, Ward's head and neck area had been compromised and a clear airway was impossible to achieve. Cadet Maxfield made the decision that chest compressions would have to be enough. Cadet Maxfield provided CPR for around 20 to 30 minutes at which time he switched off between his Uncles Adam and Tim until the mountain rescue team arrived and advised them that it was time to stop CPR. While providing CPR, large ice chunks fell from the top of the mountain and hit them repeatedly. Some of the ice chunks were one to two feet in size. Many people were telling them that it was too dangerous and that they needed to move from where they were. Cadet Maxfield knew the risk involved in continuing, but also knew that he needed to try and save his grandfather to the best of his abilities. While the rescue effort ultimately was not successful, the skills that Cadet Maxfield learned in Civil Air Patrol allowed him to competently take charge of the rescue and provide the necessary assistance despite the risks to his own safety. Through his singularly courageous heroism and selfless regard for his fellow man, C/Captain Aiden Maxfield has reflected the highest credit upon himself and Civil Air Patrol.